The DIY Bride: Emboss Invites - Check! Hello! With having MLK Day off from school and work, I decided to try my hand at another DIY project. My invites are without a doubt my biggest DIY because I have so much I want to do with them. I printed them all and cut them all with my brand new paper cutter (which rocks btw! ), and now wanted to emboss them with a stamp design. I looked and looked online for months for potential ideas of what to add to our invites to dress them up a little, but since they're hot pink, we didn't have a lot of options. That was until, I learned about embossing. To be honest, I was pretty nervous to attempt it, but after a few months of trial and error, I was finally ready to tackle our invites. Now I want to share with you how to heat emboss! 1. Getting started, you want to start out with your cardstock on a flat surface. 2. Optional Step: With your embossing buddy, rub the area where you place to emboss. I found the embossing buddy to be very beneficial because its purpose is to keep the embossing powder from sticking anywhere else other than on the embossing ink. 3. Collect your stamp and your embossing ink. Tip: The embossing ink will work best if left upside down when not in use. 4. Apply the embossing ink to the stamp. 5. 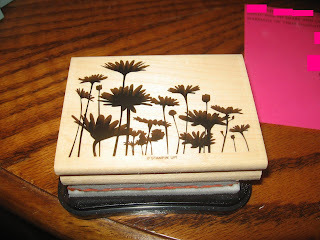 Optional Step: Using your Stamp-A-Ma-Jig, line the cardstock/paper up and place the stamp inside the Stamp-A-Ma-Jig. 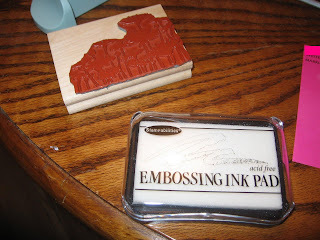 I found this tool to be very helpful since I was able to line up the stamp perfectly each time. 6. Press the stamp on the cardstock/paper. 7. Pour the embossing powder onto your image. 8. Spread the powder out with your finger to cover the entire image. 9. Shake off any excess powder into a container. 10. Optional Step: To remove any left-over powder and to clean up your image, use a small paintbrush or duster to remove any powder not wanted. Once removed, blow off any powder. 11. Once you have your image the way you want, turn on your heat gun and heat the stamped image. Once the heat gun is fully warmed up, the powder will begin melting and rising. 12. All done! Pat yourself on the back for a job well done! Embossing is such a great additive to add a little extra flavor to any paper project that you are working on. Just make sure to practice with your stamp and the technique plenty before jumping into embossing any invites, programs etc. WARNING: Your working area may look like this while working. Big mess! Looks great! I just finished embossing our napkins and I loved them!